Box was born in 1923 in Hamilton, Texas. From 1938 to 1942, he attended Jonesboro High School in Jonesboro, Texas, where he and his twin brother Boyce Box were both star athletes. He never saw a game of football until he was 18 years old, having played basketball throughout his youth. Box and his brother Boyce attended West Texas A&M University on basketball scholarships and helped the Buffaloes win a Border Conference championship in 1943 before being inducted into the United States Marine Corps. He attained a rank of captain during World War II. He also attended Louisiana Tech University as part of the V-12 Navy College Training Program. When he returned from the Marine Corps in 1946, the West Texas A&M basketball program slumped, and Box ended up playing college football as a quarterback and halfback for the West Texas A&M Buffaloes football team from 1946 to 1948. Box played professional football at the end and halfback positions in the National Football League (NFL) for five seasons with the Detroit Lions from 1949 to 1950 and 1952 to 1954. As a rookie in 1949, Box appeared in ten games, principally as a halfback. He rushed for 62 yards on 30 carries and caught 15 passes for 276 yards and four touchdowns. Box later recalled: "I probably was the worst halfback in the history of the league." 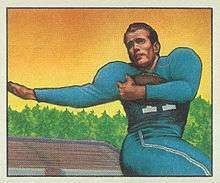 In 1950, Box's second year in the NFL, Detroit's coaches sought to take advantage of Box's speed and converted him into an end. Teaming up with Lions' quarterback Bobby Layne, Box appeared in 12 games and ranked among the league's leading receivers with 50 receptions (third), 1,009 receiving yards (second), 11 receiving touchdowns (second), 84.1 receiving yards per game (second), and 1,009 yards from scrimmage (second). On December 3, 1950, in a game against the Baltimore Colts, he set Detroit team records with 12 catches, four touchdown receptions, 24 points, and 302 receiving yards. His 302 receiving yards against the Colts was the second highest in NFL history at the time and currently ranks fifth in league history. After the 1950 season, Box was selected by the Associated Press (AP) as a second-team end on its All-Pro team. In February 1951, with the Korean War ongoing, Box was recalled from inactive reserve status by the United States Marine Corps. He missed the entire 1951 season due to military service. In June 1952, after being discharged from the Marine Corps, Box returned to the Lions. Box was the leading receiver on the 1952 Lions team that won the NFL championship. On October 19, 1952, he led a comeback victory over the Los Angeles Rams, with touchdown catches covering 64 and 10 yards. He led the NFL with 15 receiving touchdowns, ranked second in the league with 90 points scored, and again ranked among the league leaders with 924 receiving yards (fourth), 22.0 yards per reception (fourth), and 924 yards from scrimmage (sixth). In the 1952 NFL Championship Game, a 17–7 victory over the Cleveland Browns, Box was used mainly as a decoy but was credited with a key block on Doak Walker's 67-yard touchdown run. After the 1952 season, Box was selected by the AP as a first-team All Pro player and was selected to play in the 1953 Pro Bowl. In 1953, the Lions won their second consecutive NFL championship, though Box's receiving statistics declined significantly with only 16 receptions for 403 yards. He was reportedly "robbed of his blinding speed by a leg injury," though he did manage a career-long 97-yard touchdown reception against the Green Bay Packers on Thanksgiving Day 1953. In the 1953 NFL Championship Game, he had four receptions for 54 yards. In 1954, Box's final year in the NFL, he appeared in 11 games but caught only six passes for 53 yards. Over the course of his five years with the Lions, Box totaled 129 receptions for 2,665 yards and 32 touchdowns. After retiring from football, he had a long career in business. He began in 1954 as an assistant manager in the Dallas office of the George A. Fuller Company, eventually serving as chairman of the board. He became president of the Oklahoma Cement Company and president and chairman of OKC Corporation, which later became known as the Box Energy Corporation. He also served as chairman of the board of regents for West Texas State University and the Texas Board of Penal Corrections. His Cloyce Box Ranch was used as the original Southfork Ranch for the mini-series that became the first season of the television series Dallas. Box and his wife, Ashley Scott Box, had four sons. They lived in Frisco, Texas, for more than 30 years. Box died at his home in Frisco in 1993 at age 70. 1 2 3 4 5 6 7 8 9 10 "Cloyce Box". Pro-Football-Reference.com. Sports Reference LLC. Retrieved March 10, 2016. 1 2 "Jonesboro Salutes Cloyce Box At '83 High School Homecoming". The Gatesville Messenger and Star-Forum. September 22, 1983. p. 13 – via Newspapers.com. ↑ "60+ years later, graduate say thanks: Jonesboro grad's trust closed out, given to athletic department". The Gatesville Messenger & Star-Forum. April 28, 2007. pp. 1, 5 – via Newspapers.com. ↑ Tommy Devine (August 30, 1953). "Story-Book Touch Behind Box's Rise to Fame". Detroit Free Press. p. 1D – via Newspapers.com. 1 2 3 4 5 "Cloyce Box, former NFL star, dies on Oct. 24". The Gatesville Messenger. November 4, 1993. p. 10A – via Newspapers.com. ↑ "Cloyce Box Joins Pro Football Team". Corsicana Daily Sun. April 27, 1949. p. 10 – via Newspapers.com. 1 2 "Cage Snafu Made Grid Star of Box". Detroit Free Press. August 30, 1953. p. 2D – via Newspapers.com. 1 2 Jack Saylor (October 26, 1993). "Lions Top receiver Cloyce Box dies". Detroit Free Press. pp. 1C, 2C – via Newspapers.com. ↑ Bob Latshaw (December 4, 1950). "Box, Doak Team for Every Point". Detroit Free Press. p. 30 – via Newspapers.com. ↑ "Games to Remember". Pittsburgh Post-Gazette. November 17, 2013 – via Newspapers.com. ↑ "NFL Single Game Receiving Yards Leaders". Pro-Football-Reference.com. Sports Reference LLC. Retrieved March 10, 2016. ↑ "1950 AP All Pro Grid Team". The Sandusky Register. December 28, 1950. p. 16 – via Newspapers.com. ↑ "Lions Lose Cloyce Box to Marines". Detroit Free Press. February 27, 1951. p. 22 – via Newspapers.com. 1 2 Bob Latshaw (June 8, 1952). "Lions Welcome Box Back from Marines: End to Report with Rookies for Extra Work in Passes". Detroit Free Press. p. C3 – via Newspapers.com. ↑ "Cloyce Box Back Again With Lions". The La Crosse (Wisc.) Tribune. July 6, 1952. p. 26 – via Newspapers.com. ↑ "Lions Owe Win to Cloyce Box". The Ludington Daily News. October 20, 1952. p. 5 – via Newspapers.com. ↑ "Lions' Decoy, Stout Defense Won NFL Title". The Arizona Republic. December 29, 1952. p. 17 – via Newspapers.com. ↑ "Lions Rally for 34–15 Win: Cloyce Box Scores on 97-Yard Play". The Mason City (IA) Globe Gazette (AP story). November 27, 1953. p. 11 – via Newspapers.com.